Saint Alexius (Алексей or Aleksij in Russian) (before 1296–1378) was Metropolitan of Kiev and all Russia (from 1354), and presided over the Moscow government during Dmitrii Donskoi's minority. By the will of Symeon the Proud, Alexius was appointed adviser to his brothers – Ivan and Andrew. After visiting Constantinople, he was chosen to become the Metropolitan of Moscow and all Russia in 1354. 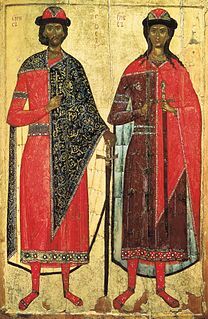 When Dmitrii Donskoi and Vladimir the Bold were young, Alexius was their spiritual tutor and served as regent at the same time. He took the side of Dmitrii Donskoi in his struggle against Tver and Nizhny Novgorod, where he once sent St. Sergius of Radonezh to suspend divine service in churches and monasteries, until the political strife was over. In 1357, Alexius was summoned by Jani Beg, the Khan of the Golden Horde, to cure his mother Taidula Khatun from blindness. The metropolitan's success is held to have prevented a Tatar raid on Moscow. In 1360s, Alexius founded the Andronikov, Chudov, and Alekseyevsky monasteries. He promoted Metropolitan Peter's canonization by the Russian Orthodox Church. Shortly before his death, Alexius fruitlessly tried to convince Sergius of Radonezh to become his successor. Alexius was an author of a number of sermons and epistles. He was canonized by the Russian Orthodox Church in 1448 and is revered as one of the patron saints of Moscow. February 12, (the day of his repose), May 20, (the day of the uncovering of his relics) and October 5, (Synaxis of the Hierarchs of Moscow). His relics are venerated in Ephiphany Cathedral in Elokhovo. 2012 film The Horde is a highly fictionalised narrative of how Alexius healed Taidula from blindness. ^ André Vauchez; Richard Barrie Dobson; Adrian Walford; Michael Lapidge (2000). Encyclopedia of the Middle Ages. Editions du Cerf. p. 39. ISBN 978-1-57958-282-1. Retrieved October 20, 2010. Andrei Rublev ; Born in the 1360s, he died between 1427-1430 in Moscow and is considered to be one of the greatest medieval Russian painters of Orthodox icons and frescos. The Trinity Lavra of St. Sergius is the most important Russian monastery and the spiritual centre of the Russian Orthodox Church. The monastery is situated in the town of Sergiyev Posad, about 70 km to the north-east from Moscow by the road leading to Yaroslavl, and currently is home to over 300 monks. Venerable Sergius of Radonezh, also transliterated as Sergey Radonezhsky or Serge of Radonezh, was a spiritual leader and monastic reformer of medieval Russia. Together with Venerable Seraphim of Sarov, he is one of the Russian Orthodox Church's most highly venerated saints. Saint Peter, Metropolitan of Moscow and all Russia was the Russian metropolitan who moved his see from Vladimir to Moscow in 1325. Later he was proclaimed a patron saint of Moscow. In spite of the move, the office remained officially entitled "Metropolitan of Kiev and All Rus'" until the autocephalous election of St. Jonah in 1448. Theognostus was Metropolitan of Kiev and all Rus'. The Chudov Monastery was founded in the Moscow Kremlin in 1358 by Metropolitan Alexius of Moscow. The monastery was dedicated to the miracle of the Archangel Michael at Chonae. The Monastery was closed in 1918, and dismantled in 1929. Job, also known as Job of Moscow was the first Patriarch of Moscow and All Russia and is a saint of the Orthodox Church. Saint Dionysius I ; secular name: David was a Russian Orthodox metropolitan in 1384–1385. Saint Alexius or Alexis of Rome or Alexis of Edessa was a fourth-century monastic who lived in anonymity and is known for his dedication to Christ. There are two versions of his life that are known to us, a Syriac one and a Greek one. Patriarch Alexy I was the 13th Patriarch of Moscow and all Rus', Primate of the Russian Orthodox Church (ROC) between 1945 and 1970. Vysokopetrovsky Monastery is a Russian Orthodox monastery in the Bely Gorod of Moscow commanding a hill whence Petrovka Street descends towards the Kremlin. Eudoxia of Moscow, with monastic name Euphrosyne, was a Grand Princess of Moscow and wife of Dmitry Donskoy. 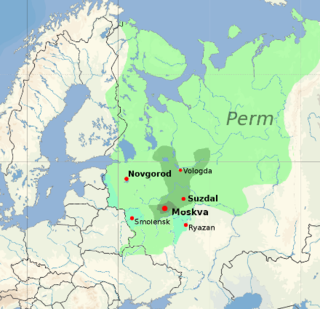 Alexander Peresvet, also spelled Peresviet, was a Russian Orthodox Christian monk who fought in a single combat with the Tatar champion Temir-murza at the opening of the Battle of Kulikovo, where they killed each other. Venerable Abraham Galitzki or Abramius of Galich or Chukhlomsky and Gorodetsky was an abbot of the Russian Orthodox Church. Pachomius the Serb, also known as Pachomius Logothetes, Russian: Пахомий Логофет, Greek: Παχώμιος Λογοθέτης) was a 15th-century Serbian hagiographer who, after taking monastic vows, was schooled on Mount Athos and mastered the ornate style of medieval Serbian literature. Cyril of Beloozero was a monk and saint of the Russian Orthodox Church who lived in the 15th century. Saint Cyril was a disciple of Saint Sergius of Radonezh. In 1397, he founded the Kirillo-Belozersky Monastery in Northern Russia, in the present-day Vologda Oblast. This list of Russian saints includes the saints canonized by the Russian Orthodox Church and the Russian saints canonized by other Orthodox Churches. The Horde is a 2012 historical film directed by Andrei Proshkin and written by Yuri Arabov. The film is a highly fictionalised narrative of how Saint Alexius healed Taidula Khatun, the mother of the Golden Horde khan Jani Beg, from blindness.